Ma Hailing is a bookworm. 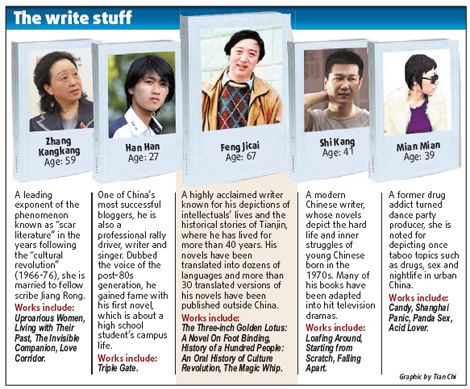 When not at work as an IT retailer in Beijing, she can usually be found reading or shopping for new novels. For her, the digital age could not have come soon enough. The 32-year-old said that being able to download books has saved her a lot of time and energy. "Thanks to the Internet, I don't have to carry around piles of heavy books, and I don't need to travel all the way to a crowded library," she said, adding that she reads downloaded novels on her Hanvon e-book tablet and 3G cell phone. Ma is one of thousands of Chinese readers taking advantage of the progress in the technology used by the telecommunications and publishing industries, which is putting an increasing number of books literally at the fingertips of consumers. At least 695 million people use cell phones in China, more than half of the population, according to figures released by the Ministry of Industry and Information Technology in July. "Reading on palm-top devices like cell phones has become the latest fad among Chinese, especially young people," said Hao Zhenxing, director of the China Publishing Science Research Institute in Beijing. A study by the institute in September suggested that at least 24 percent of Chinese between 18 and 70 years old have had a "digital reading experience", with that figure rising to 100 percent for those aged 14 to 17. 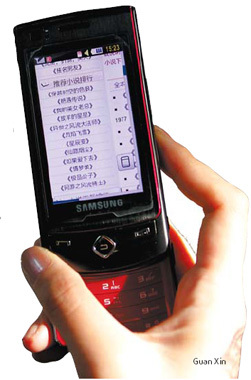 Meanwhile, the gross output of the mobile phone reading service market is expected to reach almost 60 million yuan ($8.78 million) this year, according to market research firm Frost and Sullivan. Experts agree the e-book market has huge potential in China but is being undermined by rampant pirate operations. The recent dispute with Google has highlighted the real battle Chinese authors face in protecting their copyrights online, analysts say. Google, an Internet search engine based in the United States, is seeking rights to scan and offer for download out-of-print books as part of larger efforts to create a modern-day Library of Alexandria, one of the most famous libraries of the ancient world. 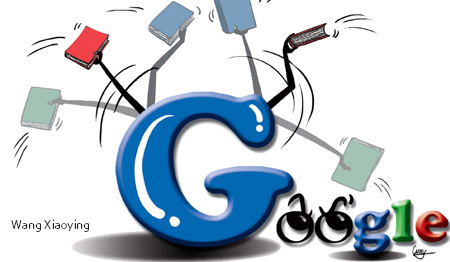 Work on Google Books, which is available to netizens only in the US, began four years ago and already boasts seven million titles in various languages under US copyright, including 18,000 by 570 Chinese writers. However, the company's methods have been controversial, especially as most books were scanned without permission from publishers and authors. "We started looking into the scanning of Chinese books after a notice from the International Federation of Reproduction Rights Organizations," said Zhang Hongbo, deputy director of the non-profit China Written Works Copyright Society. "Google may have violated the copyrights of an unknown number of Chinese authors. "Sharing cultural resources has become a trend in the Internet age, but the copyrights of any individual author should be respected and protected." Google is in the final stages of reaching settlements with two US copyright organizations, and the company announced at the weekend it would send representatives to meet China's copyright watchdog officials on Friday. On Oct 31, around 30 writers in Tianjin, including Feng Jicai, vice-chairman of the All-China Federation of the Arts and Literature, began a petition to support Zhang's society, which has more than 2,000 members. Days later in Beijing, Mian Mian became the first author to file an individual lawsuit accusing Google of violating the copyright of her 2004 novel Acid Lover. The Chinese Writers' Association will also launch a nationwide campaign this month calling for more authors to support the fight, said spokesperson Chen Qirong. Google Books is far from a legitimate library, according to Chinese lawyers, as its sole purpose is to generate revenue. "It is nothing but a vehicle through which Google can profit in the name of serving public good," said Wei Ning, a Beijing copyright lawyer. "By attracting huge numbers of authors and readers, Google will surely find smart profit models in its so-called free services. And that harms the interests of copyright holders." In an e-mail to China Daily, Google declined to detail how the company plans to resolve the dispute with Chinese authors. The company has offered a compensation settlement of $60 per book to authors, as well as 63 percent of the revenue from online reading. To reject the package and Google's right to scan their works, however, writers must appeal before Jan 5 next year. Zhang, who met with executives from Google on Nov 2, blasted the offer as unacceptable. "Google violated Chinese writers' copyright. 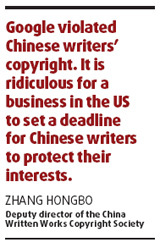 It is ridiculous for a business in the US to set a deadline for Chinese writers to protect their interests. Also, the company should clearly admit to its infringements and negotiate with Chinese authors sincerely," he said. Several Chinese experts have also warned that the aggressive expansion of Internet giants like Google could deal a fatal blow to the nation's fledgling digital publishing industry, with global markets in danger of being monopolized. "For Google, money is not an issue. Since people are about to accept the company's proposed settlement, it can then move forward with its digital publishing project, which may severely threaten locally based players," an industry expert told China Daily on condition of anonymity. Zhao Ge, chief executive of Founder Apabi, China's largest private digital library boasting more than 600,000 authorized titles, disagreed. She said: "Big and powerful as it is, Google does not know about local markets and cultures as well as local players do. The survival of search engine Baidu is a case in point." When contacted by China Daily, Google declined to comment on whether its services pose a threat to digital publishing enterprises across the world, including China. China's domestic online publishing sector has been hampered by disputes over copyrights for the past decade, significantly slowing down growth, say experts. An array of authorized public digital libraries has been launched in the past few years, including Founder Apabi, Superstar, Sursen and ChineseAll, while the nation has implemented at least 17 laws, bylaws and regulations concerning digital publishing, including the Regulations on Internet-based Publishing. However, many publishing houses are still falling prey to online copyright infringement, said Liu Fang, a veteran publisher and head of marketing for the Chinese Writers Publishing House in Beijing. Last year, his company released Yin Jianli's A Good Mother is Better than a Good Teacher (Hao Mama Shengguo Hao Laoshi), a popular parenting guide which sold 700,000 copies nationwide priced at 30 yuan. But type the title into Google, or its Chinese equivalent Baidu, and the search will result in dozens of websites where the book can be downloaded for free. "I have found hundreds of small e-shops selling pirated copies of the book at 8 to 10 yuan," said Liu. "You can also read the full text, as well as many other books published by my company, on famous Web portals for free, although none have obtained permission." Chinese Writers Publishing House is working on a joint pilot service with China Mobile Corp aimed at offering downloadable novels to almost two million cell phone customers in Zhejiang province. It will be launched on Jan 1 next year. But Liu admitted there is no fair and transparent mechanism for traditional publishing houses to monitor how much revenue digital distribution platforms, such as Web portals, digital libraries and mobile operators, generate by selling books. He also said it would be impossible for publishing houses and authors to stamp out online piracy and other infringements, and called for the law to be further tightened to protect against them. "A lot of Chinese netizens have yet to see the importance of respecting copyright, while some regulations are new and ambiguous to many viewers and digital reading service providers," added Jiang Bin, senior director of digital library ChineseAll. Curbing piracy on the Internet has been a big challenge for watchdogs worldwide, said Duan Guijian, chairman of the Copyright Protection Center of China, who advocates a new concept for resolving disputes between authors and digital publishers such as Google. "Experiences show that evidence collection is extremely difficult in the fast-changing and somewhat chaotic cyberspace," said Duan. "For copyright governance in the Internet and mobile communication age, new profit-sharing models should be set up among all parties in the industry." 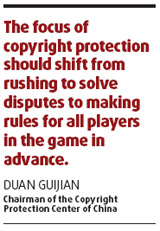 "The focus of copyright protection should shift from rushing to solve disputes to making rules for all players in the game in advance," he said. Liu Binjing, head of the State General Administration of Press and Publication, admitted the law is not strict enough, but explained the government is working on a revised draft of the Regulations on Internet-based Publishing. He did not elaborate on when the rules may be approved or implemented. Meanwhile, Li Shunde, vice-director of the intellectual property rights research center under the Chinese Academy of Social Sciences, added that the Google dispute "should sound an alarm for local publishers, authors and policymakers". "It is urgent for the Chinese digital publishing industry to renew its strategies in the face of new challenges," he said.